There are several different ways to include a likeness of a person on a memorial. We have explained some of the more well known methods here. Etched portraits can only be done on black granite. They can be done using diamond or laser etching. They can be done in black & white or color. Color is achieved using Lithochrome paint which will fade away after 10 to 20 years leaving the portrait black & white. Lithochrome paint can be touched up once it starts to fade. Black & white etchings will last forever. Porcelain portraits can be done on any color granite. They can be done in black & white or color. We have used the same company for porcelain portraits for many years. They do offer a "lifetime" warranty against fading and vandalism but we think with the newer UV coatings they use we will get between 50 and 100 years of useful life. 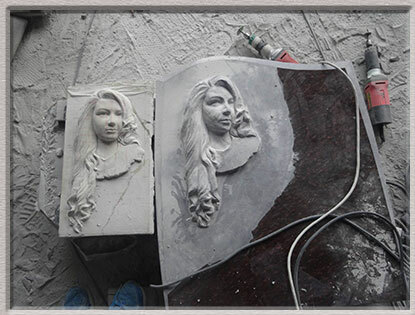 Sculpted portraits can be done on any color granite. They last forever. While sculpting is the most expensive method of artwork, due to new technologies and sources it isn't as expensive as it used to be. It does take much longer to produce so patience is required.